I have always been drawn to trains. The way they wind through towns, behind homes and across fields. Their intimate perspective of place. The constant movement forward. How the flickering of light between pine trees and the gentle rocking of the locomotive lulls me into a dream-state. Memories come and go, and for a fleeting moment — as the world rushes by outside — I feel as though every town I pass through and every landscape I perceive is a place that I belong. 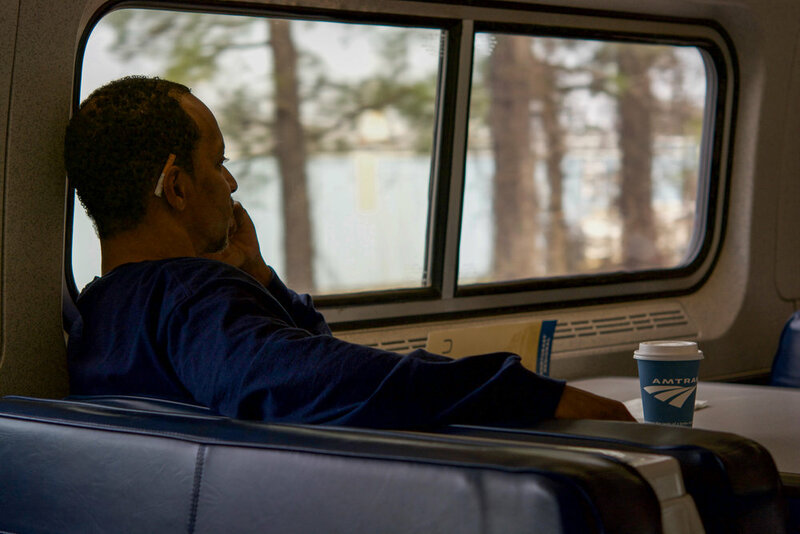 Nearly every other week over the course of a year, I’ve boarded the Piedmont and the Carolinian — two trains that travel between Rocky Mount and Charlotte — to document the travelers and communities touched by the North Carolina Railroad. These trains pass through Wilson, Selma, Raleigh, Cary, Durham, Burlington, Greensboro, High Point and Salisbury — towns that owe much to the railroad, which opened the interior region of the state in the mid-1800s. 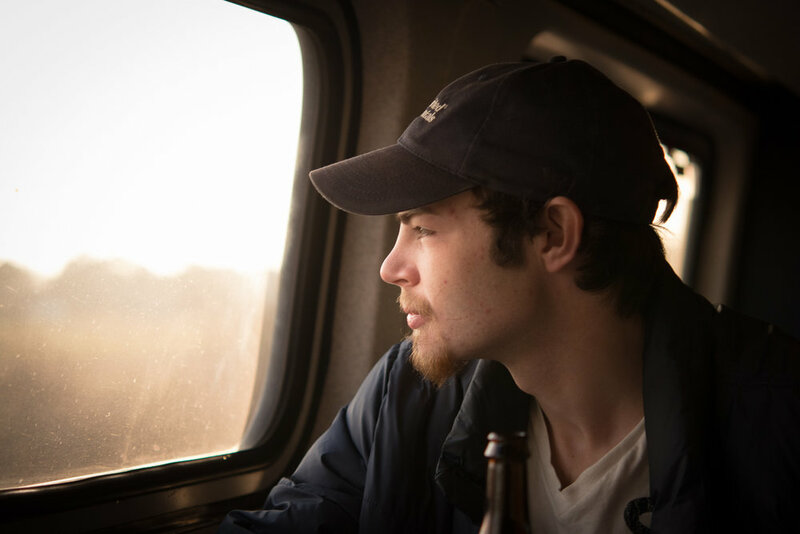 This is a story about the history and modernity of trains, told through eyes of a nostalgic, romantic traveler. Anchored in North Carolina’s Piedmont, these images depict travelers bearing witness to a world and landscape both ephemeral and historic. All at once this world belongs to me, to them and to none. This selection of photographs is part of a larger series, including an audio component, that will be exhibited at the Imperial Centre Arts Gallery in Rocky Mount, NC, Spring 2018. Approaching Selma station on Southbound train. Passengers waiting at Durham station to board train to Charlotte. Amtrak conductor assisting passengers boarding train at Durham station. Passenger car on The Piedmont, photographed early morning. Girl looking out Southbound train window, Rocky Mount. Couple traveling from Charlotte to Durham. 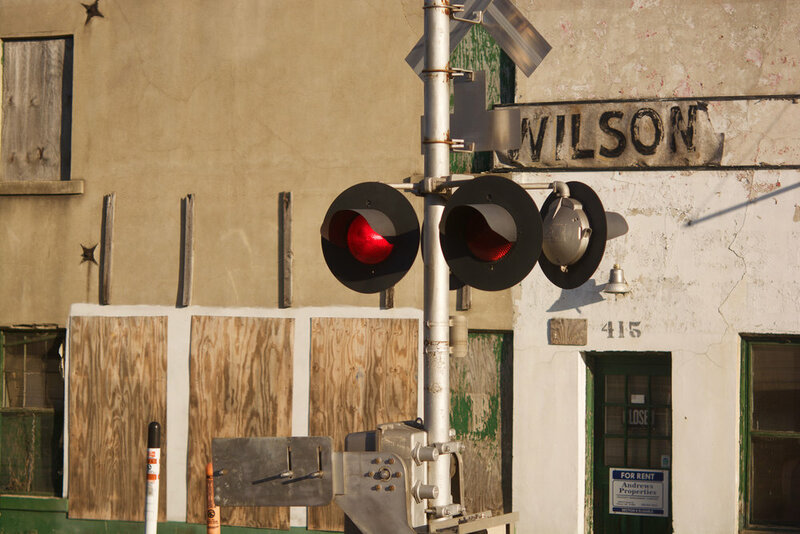 Wilson, NC, building photographed from Northbound train. Man looking cafe car window heading south through Wilson, NC. North Carolina landscape photographed from Northbound train. Amtrak employee working at concessions counter on The Carolinian, Charlotte to New York City. Man riding in cafe car on The Piedmont train heading south. Cafe window from moving train. Girl playing cards in the cafe car, Northbound train near Selma, NC. Signal lights from Northbound train approaching Wilson, NC, station.